Notes: Honeoye Falls Distillery is one of the newer distilleries in the Rochester and Finger Lakes area. Located about 30 minutes south of Rochester it is nestled in the hill and drumlins of the Finger Lakes area and draws its water from the nearby Finger Lakes of Canadice and Hemlock Lakes ( both of whom are water supplies also for the city of Rochester and known for the taste ad purity of their water.They use a second generation ( as I call it as significant improvements have been made over the first models) Artisan Still Works stainless steel steam fired still with a column and copper inserts. 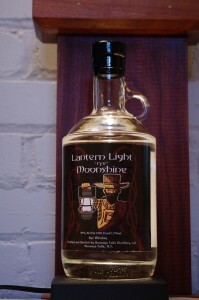 This is their unaged rye spirit called Lantern Light Rye Moonshine,made with the same grain mash bill as their vodka but brought off at a lower proof to preserve the flavors and characteristics to a greater degree than the Frozen Falls Vodka . 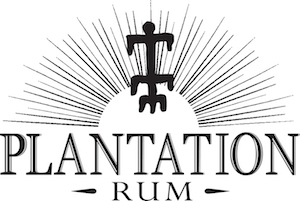 They also produce a gin called Devils Bathtub Gin, an aged rye by the name of Red Saw Rye and an extremely limited release Bourbon . Notes: The rye is made from 85% very locally grown rye and 15% of the mash bill is a 6 row malted barley from Pioneer Malting, our local Maltster. Appearance: Silvery, sap like appearance showing off a lovely grain body, clear as a bell and on swirly delivers a nicely thick coating on the glass which slowly flows back into some tears along the edge line,followed by larger droplets than what we see with their more highly distilled vodka (which makes perfect sense of course- a lower proof distilled product should display more body and deliver more taste. A hopeful sign ! First Impression: Very spicy rye bouquet with a well-integrated grain alcohol note backing it up rather than as in many cases in the foreground . Another very positive note is that there are no off smells, a carefully done and clean distillation. Too many times in a young spirit you can smell traces of bacterial funk, nothing like that here. 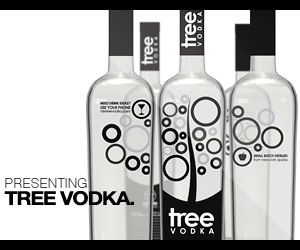 Drinks: Makes for a much more flavorful substitute for vodka in any vodka cocktail and an interesting twist on a cachaca or tequila cocktail , adding drier grain notes with the rye sweet/sour pepper to add some very interesting possibilities for the open-minded. Large paper label of rather rustic graphics on the front and their story and usual graphics on the back. Closure is a thin black plastic neck capsule with a tear off strip (thankfully – those that don’t usually involve using sharp objects to get them open). Somewhat large one piece synthetic cork. Final Thoughts: A very nicely distilled white rye whiskey which packs a lot of flavor for a modest price.